If you aren’t thrilled with your Eternal Art shower curtain, let me know within 7 days of receiving it, and return it for a full refund of the original purchase price, but not including the cost of return shipping. This listing is for a new white polyester fabric shower curtain, with the design hand painted in black. All shower curtains are hand painted by me! 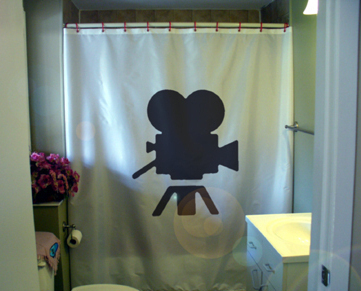 The curtain is waterproof and machine washable, and is the standard size of 70x70 inches. I only accept payments through Paypal. 7 day money back guarantee. Please feel free to have a look around! If you don't see the right design for your bathroom, just let me know, because I'd love to work on a custom design for you! Other shower curtain colours are available! Thank you and have a great day!